He came with a lizard in his beak. A choice tidbit, most appreciated. But only if you’re a Sri Lanka Grey Hornbill (Ocyceros gingalensis). The female lays up to four white eggs in a tree hole blocked off during incubation with a cement made of mud, droppings and fruit pulp. There is only one narrow aperture, barely wide enough for the male to transfer food to the mother and chicks. These birds usually live in pairs or small flocks consisting of up to five birds (2 adults and 2-3 juveniles). They are omnivores observed consuming berries, fruits, insects and small lizards. It feeds mostly on figs, although occasionally it eats small rodents, reptiles and insects. 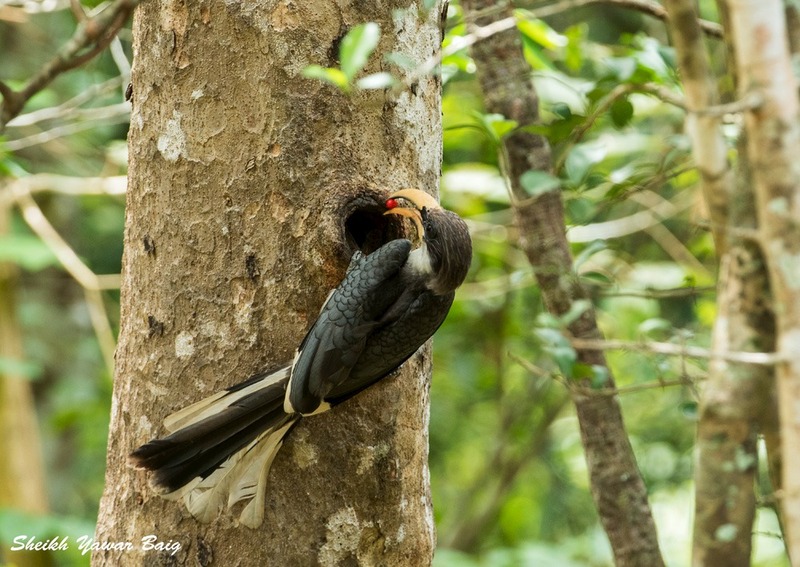 We, my friend Ifham Raji and I were parked in our open Toyota Hilux safari vehicle, our cameras mounted on sand bags placed on the roof of the cab and focused on the hole in the tree which was the Hornbill nest. We could see the beak of the female from time to time as she threw out the waste from her nest, ensuring that it remained clean. It was early morning and the forest was filled with birdsong. A Shama (White-rumped shama – Copsychus malabaricus) alighted on a twig facing me, scarcely five feet away and gave me a personal recital of his song. I wanted to photograph him but decided only to let my memory do the job for fear of scaring him away with my movement. The Shama has a black head, a brown waistcoat and a black tailcoat with two long tail feathers. On the back is emblazoned his white shield on which he hasn’t inscribed his coat of arms yet. The white shield on the back is very striking. But above all this, what impressed me was his attitude. Confidence, curiosity, friendliness. He came, he saw, he sang and he conquered my heart. Meanwhile the male Hornbill came with his delicacy but looked extremely suspicious and skittish. I wondered whether we were the cause of his alarm or anything else, until I saw two other Hornbills, fully grown juveniles, that flew in as if they’d been lying in wait for him. One, which I think was the male, dive-bombed him to try to make him drop his catch. That was fairly easily taken care of by the simple action of swallowing it. When this tactic didn’t work after trying it several times, the male gave up and went off into the forest. The female decided that the best way was to appeal to whatever nobility existed in the heart of her father and simply begged. She did that so pathetically and effectively that he eventually coughed up something for her. I say “father” because that’s who he was. These two were his fully grown millennial chicks from a previous brood, who know what human millennials worked out only in this generation. That it’s easier to live off your parents than to work for your own living. Hornbill youngsters do that for a year or more after they are fully fledged until the parents finally kick them out altogether. The interaction was fabulous to watch. This is my greatest pleasure in bird photography; watching interaction as birds afford you an opportunity that mammals and reptiles don’t. Birds go about their lives as if you don’t exist and allow you a glimpse into their lives that’s a privilege which pays the patient who value their time. You may be surprised to see the use of the phrase, “value their time”, in a context different from the usual. We imagine that our frenetic lifestyle is worthwhile and that the best use of time is to cram as much into it as possible with no thought about what we get as a result. I believe that the best use of time is to consider the result in whatever we propose to do with it and then spend the time only if the result warrants it. Time is not money. Time is far more valuable than money. Money can be earned, lost but replaced. Time is free, can be lost but never replaced. That’s why I’m very careful with my time and consider sitting for six hours watching a Hornbill father take care of his mate, while avoiding the raids of his children, one of the most beneficial uses of my time. That’s how long it took us to get some decent photographs. So now there was the father, finally having got rid of his pesky brood, ready to feed his mate. But with what, I wondered. Because he had swallowed the lizard to save it from being eaten. Sounds oxymoronic but there it was. So I watched. He looked all around. Called a few times to assure his mate that he still loved her. His raucous call that can be music only to a female Hornbill’s ears. He flew from perch to perch all around the nest-hole to assure himself from every angle that the coast was clear. Then he landed on the vertical trunk of the tree, on the lip of the nest-hole. Then I loed and beheld, to my amazement, the lizard emerge. And after it, a large green beetle, a large black beetle, a large grey caterpillar, and one after another a series of black berries (not the phone, real ones). Not having been a Hornbill ever, in my career, nor privy to his loading sequence, I can’t say if everything came out as it was ingested. But the lizard was last in, first out. Then he was off. The second trip was a repeat of the first. We wait and wait. The Shama takes pity on us and returns to sing us another song. Then the juveniles return to check out if dad is back with food. The male chick is chased out of another part of the forest by a highly aggressive and territorial Golden Oriole. The GO is one sixth or less in size but has ten times his courage. So throwing all dignity to the wind, the Hornbill chick makes haste with the GO in hot pursuit. All he had to do was to stand and say, “Okay, do your worst.” And the Oriole would have come face to face with his limitations. But this is a world of deception, even for birds and noise counts more than action. I sensed something behind us. I had been listening to some movement in the forest with an occasional branch breaking and dry leaves gently rustling. Could be jungle fowl or monkeys. But as I turned around, I saw the biggest cow elephant that I’ve ever seen in this part of the world. Sri Lankan elephants are the biggest of Asian elephants and this one was proof. She came out of the forest like a shadow, in total silence. She turned and looked at us in the safari jeep, barely 20 meters from her. Then she turned and walked away with elephantine dignity that only elephants can muster. No aggression, no posturing. Someone who knows herself and her own power and has no need to demonstrate it to anyone. Someone who is content even to let those intruding into her space, to do so without protest, as long as they are respectful. Big question in my mind is what she was doing alone. Where was her family? We saw her twice more, both times alone. I wonder what that story is. Meanwhile the Hornbill returned, this time, regurgitating a series of red berries, one after another and passing them to his mate through the hole in the wall. It was amazing to see the precise nature of the sequence where he would bring out one at a time, run it up his long beak, and very delicately drop it into the nest. I didn’t see him actually feeding his mate nor did I see her take the fruit from his beak. But it all went into the nest-hole. A Barking Deer cautiously made his way out of the forest on my right and hurriedly crossed the open patch of the road and entered the undergrowth on my left. My dilemma was whether to photograph him and risk disturbing the Hornbill. But he solved my dilemma by taking off again on his never ending quest to keep his spouse happy. Never saw anyone work so hard at this. Reminded me of the picture I see every morning in my mirror. Yeah! I know. Where’s the scene of all this action? Wilpattu National Park, Sri Lanka. A world heritage site and the oldest national park in the country. Flat land, very sandy, with very large trees and lots of lakes. Villu is Tamil for lake and Pattu means ten. There are more than forty in the park but ten large ones, thus the name. The Sri Lankan Department of Wildlife Conservation (much better name than Forest Department, because it speaks of their focus), has built bungalows (rather grand name for cottages) on the banks of some lakes. They location makes up for the lack of maintenance and resultant challenges is staying in them. The one we stayed in had no door handles or latches. So at night I had to push an extremely heavy bed against the door to keep out any potentially unwelcome visitors. The same was the case with the bathroom with the added joy that the floor tiles squelched and squirted water, ever time you stepped on them. But the joy of a cold shower at the end of a hot, humid day compensated for the squelchy floor tiles. The bungalows have solar power but no fans or plug points. So no charging of phones. There is no signal anyway so the death of the phone goes unmourned. But the impending demise of camera batteries is another matter. At any rate this adds to the excitement of trying to conserve battery power and shooting wisely. Also no fans means that hot humid days are exquisite torture. But all you need to do, to forget the discomfort is to look out from the veranda at the lake before you. Brown grass in the foreground, getting greener as it nears the water. Lush green grass closer to the water, then reeds and then the inviting blue of the lake itself. Do not yield to the invitation to jump in. Jump into the squelchy shower instead because in Wilpattu and Yala, every puddle has its resident croc. Not the shoes but the real ones. Ranging in size from cute and cuddly to enormous maneaters, which probably never ate a man and so would be doubly anxious to try one out. You’ll also see lots of birds on the Villus (lakes, remember?). On our Villu, in one afternoon, I saw a pair of Wooly-necked storks walking purposefully looking at the ground. An Adjutant Crane (a very ugly bird) walking with whatever dignity it could muster while being harassed and chased away by a pair of Red-wattled Lapwings, screeching their alarm call, Did-you-do-it, Did-you-do-it? The Adjutant hadn’t but his reputation of eating eggs and chicks is enough to pronounce him guilty in the eyes of the Lapwings and they didn’t want him in the vicinity. Then there was a pair of Malabar Giant Hornbills crossing the lake, their characteristic flight, their signature. There were perhaps thirty or forty butterflies congregating on a patch of moisture. They attracted the attention of a Green Bee Eater, which decided that he was not bound by his name and had no objection to eating butterflies also. After the fourth swooping flight and the fourth butterfly which became history, they got the message and dispersed. But not before a fifth one was picked through the air. GBE’s are such graceful flyers and such attractive birds. What strikes me yet again is how alive the forest is. As we were sitting in the jeep waiting for the Hornbill to turn up, I could hear an absolute orchestra of bird song. I could identify five or six but there were at least another dozen that I didn’t recognize. Yet all this is not noise or cacophony just like the infinite variety of color has nothing that’s mismatched. After we got the last shot, we headed back for our bungalow. As we came to yet another lake, this one covered in white lotus flowers, I spotted a pair of Eurasian Thick-knees (Eurasian Stone Curlew) doing what they do best; just being. I recalled having spotted them many times in several countries but always simply being; doing nothing. What’s their purpose in life, I asked myself. They do nothing. Not even search for food; at least whenever I was watching. Ifham tells me, “I know a lot of people in the cities who run around all day but do nothing. These birds are doing it better because they’re doing it without expending any energy.” And he’s right, isn’t he? There was an Egret which was flirting with a baby crocodile. Until the little croc lunged forward. The Egret did some inspired gymnastics and got away otherwise the little croc would have had a bird brain for dinner. The sun had set. We finished our dinner. I’m sitting with my cup of tea after which I intend to go to bed. A Cheetal (Axis deer) sounds an alarm, the Langur sentinel takes up the call, then a Sambar bells his call. Now I can be sure that the leopard is on the prowl. Leopards are the apex predator in Sri Lanka and so the Sri Lankan leopard (Panthera Pardus Kotiya) is the largest of its species. He behaves the way a tiger behaves in the Indian forest and so if you want to see leopards, Sri Lanka is the place. Since they have no enemies, they walk around during the day and are very relaxed when you spot them either dozing on a tree branch or on the ground, in the shade of a tree. You’d never see that in India or Africa where leopards must always be on the lookout for tigers and lions, who will kill them as soon as look at them. But in Sri Lanka they have nothing to fear and so are much easier to spot. I hope the leopard will come around the bungalow in the night and I get to hear his sawing grunts. The night is alive with its own sounds. Nightjars announcing that they’re on duty. The Brown Fish Owl calling his mate. Two Spotted Owlets discussing hunting strategy. Langurs murmuring after hearing the far sentinel announcing that the leopard’s on the move. Life goes on. The struggle continues. Some win. Some lose. For some, it is only fun. He also serves who only bears witness. Thanks, Mr. Baig, for the nice article.